I am a South-African girl who is addicted to travelling and seeing the world. I was born with the travel bug. You could say it’s a curse, because the adventure of travel is all I ever think about. I love exploring and travelling around the world and am having lots of fun sharing my travel stories and pictures so that you can see why I love it so much. I have been travelling and working my way around the world for more than a decade now and have had some amazing experiences along the way. When you live in a country you get to experience it from a different view than that of the ordinary tourist, I think it’s the people of the country and the little crazy everyday things that keep it interesting. One of the biggest misconceptions about travel is that you have to have a stash of cash to be able to take big trips. It’s simply not true. You don’t have to be wealthy, or even make an above average salary. You just have to choose travel over “stuff”. 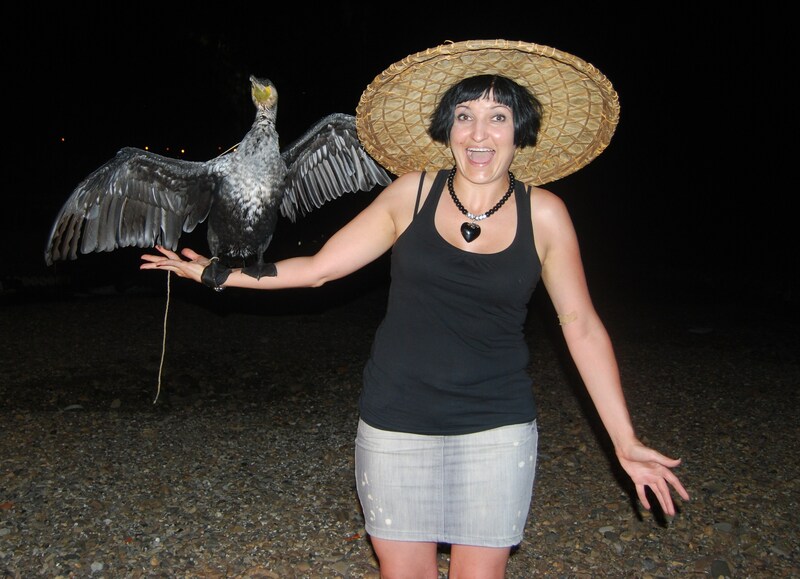 I got to have a Cormorant on my arm!!! My first job abroad was in the Bahamas and Caribbean on a cruise ship. I swam with stingrays at Sting-ray City and drove down the Mexican coast of Cozumel on a moped. Loved New York and Charleston– would go back any time. Moved to England for a while where I stayed all over the place. Bath was the best place to live but ended up in Cambridge. Backpacked through Spain and Portugal, even made a pit stop on the island of Majorca. Fell in love with Barcelona, the art, people and definitely the seafood paella. Grenada took my breath away and had too much port in Porto. Had a snowball fight next to the Eiffel tower in Paris and stuffed myself with chocolate crepes. Had a break in Egypt where I saw the sun come up over the Valley of Kings and Queens in a hot air balloon. Duck and dived the traffic with my bright yellow Honda cup motorbike and enjoyed the sunshine in Vietnam for a while. Got lost while exploring Angor Wat in Cambodia while drinking cafe sau da. On my way to Japan I made a pit stop in South Korea to taste kim chi. Stalked the geisha in Kyoto, Japan before heading to Hiroshima for a sad memorial service. Lived in the desert of the UAE for a while, even rode on a camel! Had my full of baklava in Turkey and walked along the Via Dalarosa in Jerusalem during Christmas. 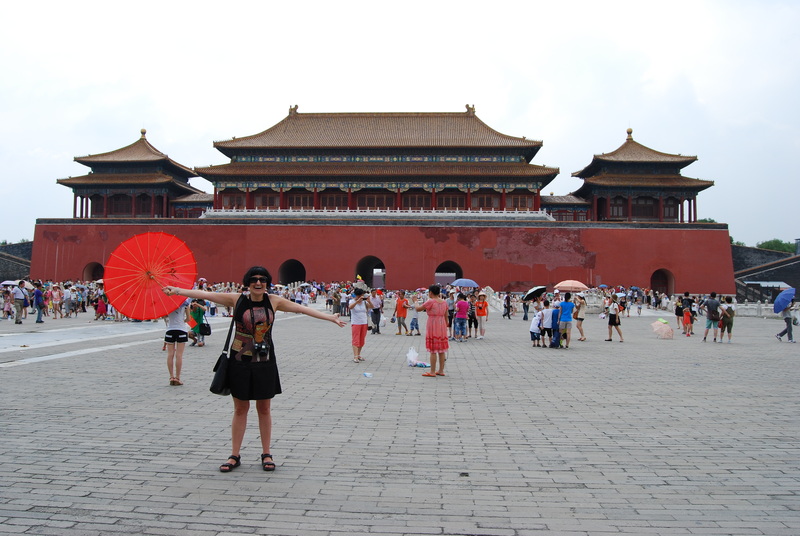 Me in front of the East Glorius Gates we just walked through to enter the Forbidden City. I lived in Russia for 2 years and learned to appreciate good Russian vodka. I walked the streets of St Petersburg during “White Nights” and mastered walking on snow and ice during the cold winter. I walked along the Great Wall of China after cruising down the Yangtze River during my China Odyssey. My next adventure took me to South America. I lived and worked in the street art filled Santiago, Chile for a couple of weeks where I got to stand knee deep in snow on the Andes Mountains. I moved back to South Africa where I worked at Pentravel, a Leisure travel company in Cape Town as a Travel Agent before returning to teaching English! I have just moved to Shanghai, China where I will be living for the next year of two!! Im on the Canopy Walkway in Kirstenbosch Botanical Gardens, cape Town!! My challenge to you: Choose one place that you want to go, and pick a date in the next nine months to go there. Buy your plane tickets immediately. Once you do that, you are committed! Get excited and make a promise to yourself to do this every year. Feeling like a kid in Disneyworld!!! All material contained within this blog, whether photographic or written is subject to copyright. Unauthorized use and/or duplication of this material without prior approval and permission granted by the author, is strictly prohibited. Excerpts and links to photography may be used, provided that © Janaline Smalman is credited, such that it directly refers to and reflects the original source and material content. Oh wow!! Hope you get to go to Cape Town again as it is my favourite part of the country!! Safe travels!! Thank you so much! I feel like I am living the dream! !